I gave my mother and my mother-in-law a photo calendar. 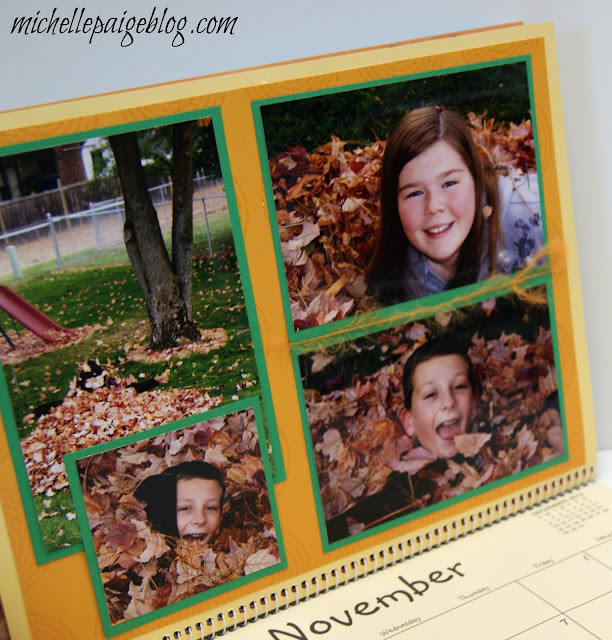 For each month of the calendar I had carefully selected pictures of their (then) only grandchild. In January, my daughter was sitting in the snow, in July she was splashing in her baby pool, in September she was sitting in the leaves. 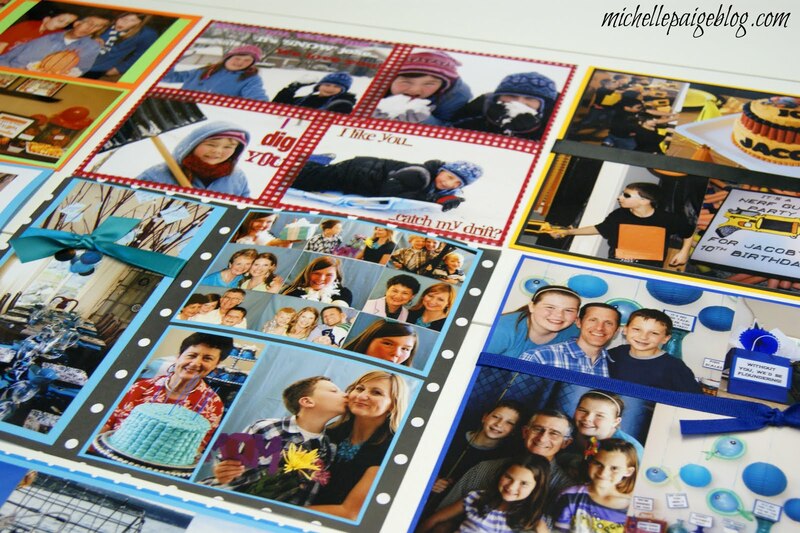 I made each page look like it came out of a scrapbook...cardstock, ribbon, brads, the works. I used a colored blank calendar I ordered from Current. The grandmas were beyond thrilled! They studied each month and 'oooohed' and 'ahhhed'. My mom promptly hung the calendar on the wall to admire. My mother-in-law immediately started filling in her appointments on her calendar and stuck it in her bag to carry everywhere. They both asked for another calendar the next year. For the next several years, I made calendars for the grandmas. One year to save time, I made the calendars digitally with one big picture on each month. My mom was a bit disappointed. "Where's the pretty layouts? Where's the ribbons? what am I doing the week before Christmas every year? I need you to know, I actually enjoy making them. so taking the time to make the calendars is quite fun. 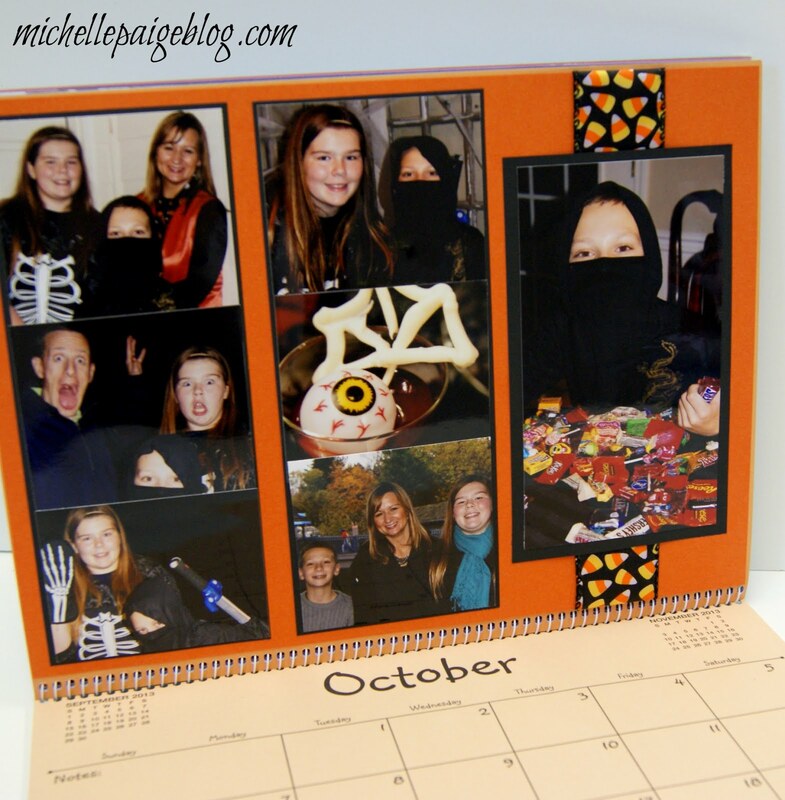 I love looking back and reviewing our year month by month. I just wish I wouldn't wait until December to get working on this project! Here's a few shots of the calendars for 2013.
is to keep myself accountable to my new goal. Goal: I will start working on the 2014 calendars in July! May 2014 be filled with met goals and less stress! 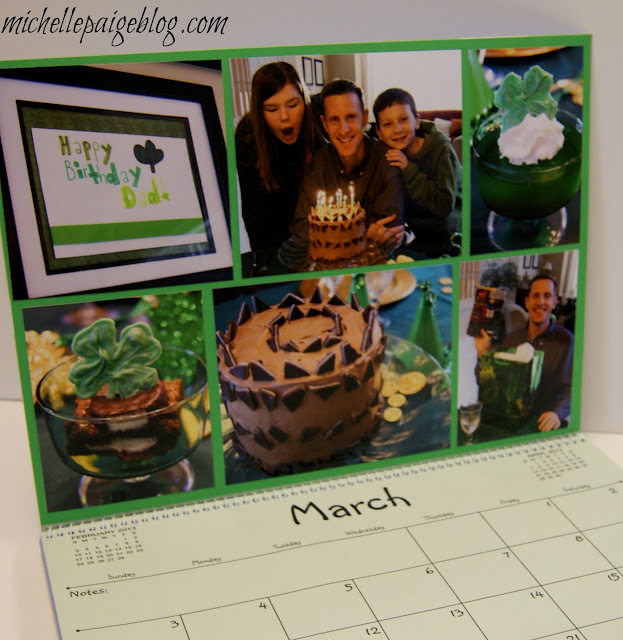 My daughter,Becky Valentine, makes the scrapbook pages each month at scrapping class, fills them with photos and copies them to make several calendars for family. Hers hangs by the computer. My other daughter makes hers on the computer at Shutterfly with downloaded backgrounds, cute comments, photos inserted on birth dates and anniversaries, and varying the layouts a bit for each grandparent. (We don't want a ton of pictures of the in-law side of the family in every month and they don't want ours. They get photos of their other children that way.) 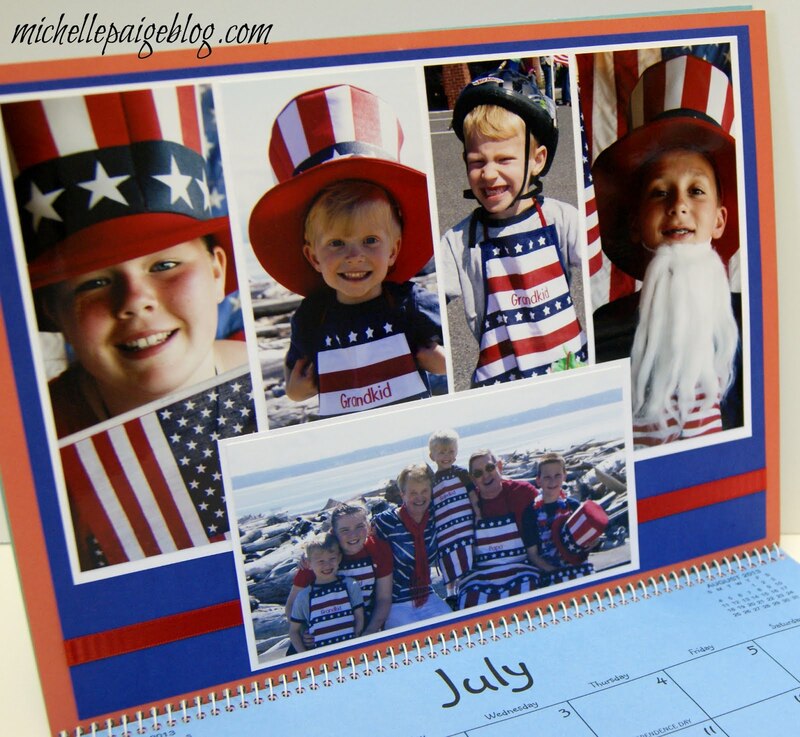 The calendars get printed, sent to her and distributed by Christmas. I get mine for my October birthday so I can start putting in dates and appointments for the new year sooner. I love both, so it is a win-win situation for the creative talents of each or the time it takes. LOL! I posted a comment on Facebook than came to the blog to look at your pages some more and saw my mother's comment, that was very similar to my Facebook comment. Great minds thing alike. 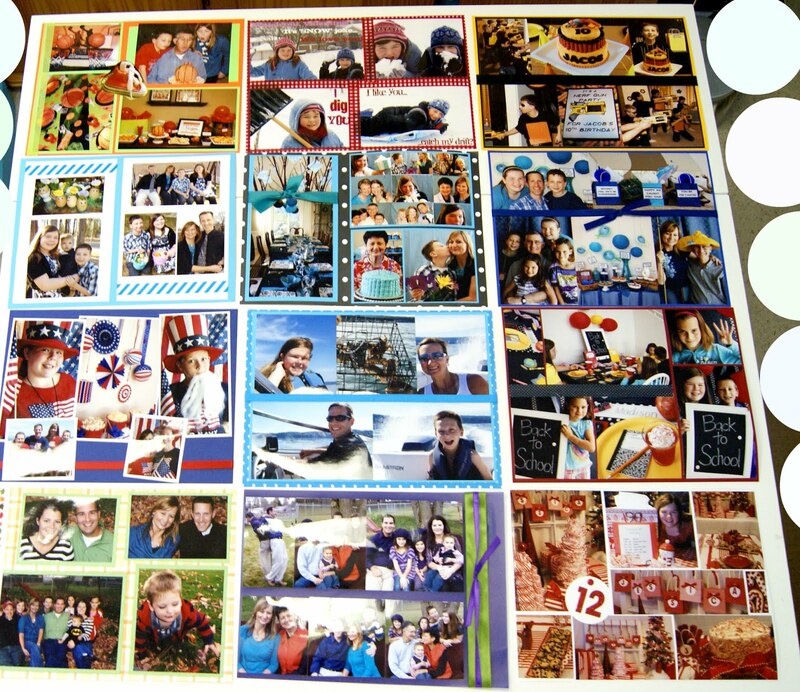 What a fun gift!I should make one of these for my MIL! I make one for my parents every year. They love it!